You are invited to attend an educational briefing on tuberculosis - what it is, how it spreads and why we have not eliminated this ancient disease that persists in the U.S. and is the second leading infectious disease worldwide, killing 1.4 million people annually. All U.S. states continue to report cases of TB. Border states and those with large Native American and other racial and ethnic minority populations face special challenges. Special areas of focus of the briefing will include drug resistant TB and TB in children. Worldwide, major gains have been made in expanding access to treatment but there are still challenges ahead including ensuring prevention and care of multidrug-resistant tuberculosis. Join us to learn why U.S. leadership on this global health threat is critical. The TB problem is not too big to solve! From scientists to advocates to communities, committed people around the world are fighting against this devastating disease. Please join us as some of these everyday heroes share experiences and stories about the challenges they face and solutions to move us forward. The event is open to the general public and will feature guest speakers from several African countries, the Executive Secretary of the Stop TB Partnership and the District of Columbia Department of Public Health. There will be interactive activity sessions and more. 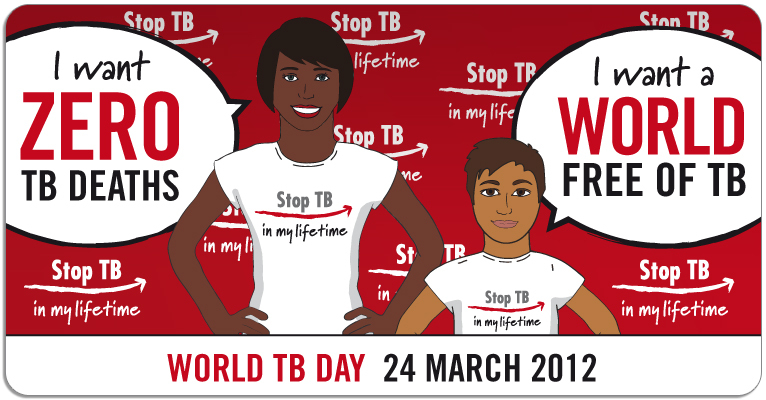 You will also learn how you can take action to create a world free from TB. RSVP: Please RSVP to Holly Greb at hgreb@path.org by March 9, 2012. Dans le cadre de la journée mondiale de lutte contre la tuberculose et à l’initiative de l'Institut de Pharmacologie et de Biologie Structurale (CNRSUniversité de Toulouse), le Muséum de Toulouse accueille une rencontredébat regroupant des conférences d’intervenants du CNRS, de l’OMS, de TB-VI et d'UNITAID. Toulouse occupe une position stratégique dans la lutte contre la tuberculose. Plusieurs laboratoires sont impliqués dans la recherche tant sur la maladie elle même que sur les moyens de son contrôle. Les acteurs issus des différentes structures présenteront au public, à l’occasion de cette rencontre, l’épidémiologie de la maladie, les grands enjeux de santé publique et la recherche telle qu’elle est menée dans nos laboratoires. Par ailleurs, les enjeux économiques et la question du financement de la recherche de nouveaux vaccins seront discutés. "Eliminer la tuberculose, est-ce possible ?" "La tuberculose: tous concernés !" "Des sanatoriums à la post-génomique : nouveaux regards sur la tuberculose"
The UCL Institute for Global Health is marking World TB Day with a meeting that addresses tuberculosis as a challenge to London and UK health services and sets it in a global context, with the launch of Tuberculosis and TB/HIV; Controversies and unanswered questions, a Journal of Infectious Diseases special supplement edited by Professor Ali Zumla (UCL Centre for Clinical Microbiology) and Marco Schito (National Institutes of Health, USA). The introductory session includes presentations from NHS London and UCL researchers, and will focus on local initiatives to combat tuberculosis. Most of the day will be devoted to presentations by the lead authors from the JID supplement, which addresses the key issues in TB control today with presentations on drug development, clinical trials, diagnosis and biomarkers, epidemiology immunology and paediatric tuberculosis. The meeting will be of interest to scientists, clinicians and students. The conference is free to attend but registration is required. 13.40: Prof. Dr Charles Mgone, Executive Director of the European and Developing Countries Clinical Trials Partnership (EDCTP): How EDCTP strengthened North/South and South/North collaborations in tuberculosis clinical trials. 14.40: Discussion and conclusions by Mr Charles Goerens.